The native form of this personal name is Kossuth Lajos. This article uses the Western name order. Lajos Kossuth de Udvard et Kossuthfalva (Hungarian: [ˈlɒjoʃ ˈkoʃut], archaically English: Louis Kossuth; 19 September 1802 – 20 March 1894) was a Hungarian lawyer, journalist, politician and Governor-President of the Kingdom of Hungary during the revolution of 1848–49. With the help of his talent in oratory in political debates and public speeches, Kossuth emerged from a poor gentry family into regent-president of Kingdom of Hungary. As the most influential contemporary American journalist Horace Greeley said of Kossuth: “Among the orators, patriots, statesmen, exiles, he has, living or dead, no superior.” Kossuth's powerful English and American speeches so impressed and touched the most famous contemporary American orator Daniel Webster, that he wrote a book about Kossuth's life. He was widely honored during his lifetime, including in Great Britain and the United States, as a freedom fighter and bellwether of democracy in Europe. Kossuth's bronze bust can be found in the United States Capitol with the inscription: "Father of Hungarian Democracy, Hungarian Statesman, Freedom Fighter, 1848–1849". The house in Monok where Kossuth was born. Kossuth's chair, now in the Great Protestant Church of Debrecen (1848). Kossuth was born in Monok, Kingdom of Hungary, a small town in the county of Zemplén, as the oldest of four children in a Lutheran noble family of Slovak origin. His father, László Kossuth (1762–1839), belonged to the lower nobility, had a small estate and was a lawyer by profession. László Kossuth had two brothers (Simon Kossuth and György Kossuth) and one sister (Jana). The ancestors of the Kossuth family had lived in the county of Turóc (now Slovak: Turiec, northwest Slovakia) in the north of Hungary since the 13th century. The mother of Lajos Kossuth, Karolina Weber (1770–1853) was born to a Lutheran family of partial German descent, living in Upper Hungary (today Slovakia). His mother raised the children as strict Lutherans. Kossuth studied at the Piarist college of Sátoraljaújhely and one year in the Calvinist college of Sárospatak and the University of Pest (now Budapest). Aged nineteen, he entered his father's legal practice. He was popular locally, and having been appointed steward to the countess Szapáry, a widow with large estates, he became her voting representative in the county assembly and settled in Pest. He was subsequently dismissed on the grounds of some misunderstanding in regards to estate funds. Shortly after his dismissal by Countess Szapáry, Kossuth was appointed as deputy to Count Hunyady at the National Diet. The Diet met during 1825–1827 and 1832–1836 in Pressburg (Pozsony, present Bratislava), then capital of Hungary. Only the upper aristocracy could vote in the House of Magnates (similar to the House of Lords in Britain), however, and Kossuth took little part in the debates. At the time, a struggle to reassert a Hungarian national identity was beginning to emerge under leaders such as Wesselényi and the Széchenyis. In part, it was also a struggle for economic and political reforms against the stagnant Austrian government. Kossuth's duties to Count Hunyady included reporting on Diet proceedings in writing, as the Austrian government, fearing popular dissent, had banned published reports. The high quality of Kossuth's letters led to their being circulated in manuscript among other liberal magnates. Readership demands led him to edit an organized parliamentary gazette (Országgyűlési tudósítások); spreading his name and influence further. Orders from the Official Censor halted circulation by lithograph printing. Distribution in manuscript by post was forbidden by the government, although circulation by hand continued. In 1836, the Diet was dissolved. Kossuth continued to report (in letter form), covering the debates of the county assemblies. The newfound publicity gave the assemblies national political prominence. Previously, they had had little idea of each other's proceedings. His embellishment of the speeches from the liberals and reformers enhanced the impact of his newsletters. After the prohibition of his parliamentary gazette, Kossuth loudly demanded the legal declaration of freedom of the press and of speech in Hungary and in the entire Habsburg Empire. [better source needed] The government attempted in vain to suppress the letters, and, other means having failed, he was arrested in May 1837, with Wesselényi and several others, on a charge of high treason. After spending a year in prison at Buda awaiting trial, he was condemned to four more years' imprisonment. His strict confinement damaged his health, but he was allowed to read. He greatly increased his political knowledge, and also acquired, from the study of the Bible and Shakespeare, a thorough knowledge of English. Kossuth's arrests caused great indignation. The Diet, which reconvened in 1839, demanded the release of the prisoners, and refused to pass any government measures. Austrian prime minister Metternich long remained obdurate, but the danger of war in 1840 obliged him to give way. While Wesselényi had been broken by his imprisonment, Kossuth, partly supported by the frequent visits of Teresa Meszleny, emerged from prison in better conditions. Immediately after his release, Kossuth and Meszleny were married, and she remained a firm supporter of his politics. Although Meszleny was a Catholic, Roman Catholic priests refused to bless the marriage, as Kossuth, a Protestant, would not convert. This experience influenced Kossuth's firm defense of mixed marriages. They had three children: Ferenc Lajos Ákos (1841–1914), who was Minister for Trade between 1906 and 1910; Vilma (1843–1862) and Lajos Tódor Károly (1844–1918). Kossuth had now become a national icon. He regained full health in January 1841 and was appointed editor of Pesti Hírlap, a new Liberal party newspaper which received the government licence. The paper achieved unprecedented success, soon reaching the then immense circulation of 7000 copies. A competing pro-government newspaper, Világ, started up, but it only served to increase Kossuth's visibility and add to the general political fervour. Kossuth pleaded in the newspaper Pesti Hírlap for rapid Magyarization: "Let us hurry, let us hurry to Magyarize the Croats, the Romanians, and the Saxons, for otherwise we shall perish". In 1842 he argued that Hungarian had to be the exclusive language in public life. He also stated that "in one country it is impossible to speak in a hundred different languages. There must be one language and in Hungary this must be Hungarian". Kossuth's assimilatory ambitions were disapproved by Zsigmond Kemény, though he supported a multinational state led by Hungarians. István Széchenyi criticized Kossuth for "pitting one nationality against another". He publicly warned Kossuth that his appeals to the passions of the people would lead the nation to revolution. Kossuth, undaunted, did not stop at the publicly reasoned reforms demanded by all Liberals: the abolition of entail, the abolition of feudal burdens and taxation of the nobles. He went on to broach the possibility of separating from Austria. By combining this nationalism with an insistence on the superiority of the Hungarian culture to the culture of Slavonic inhabitants of Hungary, he sowed the seeds of both the collapse of Hungary in 1849 and his own political demise. In 1844, Kossuth was dismissed from Pesti Hírlap after a dispute with the proprietor over salary. It is believed that the dispute was rooted in government intrigue. Kossuth was unable to obtain permission to start his own newspaper. In a personal interview, Metternich offered to take him into the government service. Kossuth refused and spent the next three years without a regular position. He continued to agitate on behalf of both political and commercial independence for Hungary. He adopted the economic principles of Friedrich List, and was the founder of a "Védegylet" society whose members consumed only Hungarian produce. He also argued for the creation of a Hungarian port at Fiume (Rijeka). "his intense personal ambition and egoism led him always to assume the chief place, and to use his parliamentary position to establish himself as leader of the nation; but before his eloquence and energy all apprehensions were useless. His eloquence was of that nature, in its impassioned appeals to the strongest emotions, that it required for its full effect the highest themes and the most dramatic situations. In a time of rest, though he could never have been obscure, he would never have attained the highest power. It was therefore a necessity of his nature, perhaps unconsciously, always to drive things to a crisis. The crisis came, and he used it to the full." Count Széchenyi judged the reform system of Kossuth in the pamphlet of Kelet Népe from 184. According to Széchenyi, the economic, political and social reforms have to be installed slowly and very carefully so that Hungary avoid the violent interference of the Habsburg dynasty, which interference can lead to a tragic end. Széchenyi was listening to the spread of the expansion of Kossuth’s ideas in the Hungarian society, which did not consider the good relation to the Habsburg dynasty. Kossuth ignored the role of aristocracy and intruded any kinds of social stratus. In contrast, Kossuth believed that the society could not be forced into a passive role by any reason through social change. According to Kossuth, the wider social movements can not be continually excluded from the political life. Therefore, he supported democracy and did not believe in the complete power of the elites and the government. In 1885, Kossuth named Széchenyi as a liberal elitist aristocrat while Széchenyi considered himself to be a democrat. Széchenyi was an isolationist politician while according to Kossuth the strong relations and collaboration with international liberal and progressive movements are essential for the success of liberty. Széchenyi's economic policy based on the Anglo-Saxon free-market principles, while Kossuth supported the protective tariffs due to the weaker Hungarian industrial sector. Kossuth wanted to build a rapidly industrialized country in his vision while Széchenyi wanted to preserve the traditionally strong agricultural sector as the main character of the economy. Kossuth in 1859, by Adam-Salomon. The crisis came, and he used it to the full. On 3 March 1848, shortly after the news of the revolution in Paris had arrived, in a speech of surpassing power he demanded parliamentary government for Hungary and constitutional government for the rest of Austria. He appealed to the hope of the Habsburgs, "our beloved Archduke Franz Joseph" (then seventeen years old), to perpetuate the ancient glory of the dynasty by meeting half-way the aspirations of a free people. He at once became the leader of the European revolution; his speech was read aloud in the streets of Vienna to the mob which overthrew Metternich (13 March); when a deputation from the Diet visited Vienna to receive the assent of Emperor Ferdinand to their petition, Kossuth received the chief ovation. Lajos Batthyány, who formed the first responsible government, appointed Kossuth as the Minister of Finance. He began developing the internal resources of the country: re-establishing a separate Hungarian coinage, and using every means to increase national self-consciousness. Characteristically, the new Hungarian bank notes had Kossuth's name as the most prominent inscription; making reference to "Kossuth Notes" a future byword. A new paper was started, to which was given the name of Kossuth Hirlapja, so that from the first it was Kossuth rather than the Palatine or prime minister Batthyány whose name was in the minds of the people associated with the new government. Much more was this the case when, in the summer, the dangers from the Croats, Serbs and the reaction at Vienna increased. In a speech on 11 July he asked that the nation should arm in self-defense, and demanded 200,000 men; amid a scene of wild enthusiasm this was granted by acclamation. However the danger had been exacerbated by Kossuth himself through appealing exclusively to the Magyar notables rather than including the other subject minorities of the Habsburg empire too. The Austrians, meanwhile, successfully used the other minorities as allies against the Magyar uprising. While Croatian ban Josip Jelačić was marching on Pest, Kossuth went from town to town rousing the people to the defense of the country, and the popular force of the Honvéd was his creation. When Batthyány resigned he was appointed with Szemere to carry on the government provisionally, and at the end of September he was made President of the Committee of National Defense. From this time he had increased amounts of power. The direction of the whole government was in his hands. Without military experience, he had to control and direct the movements of armies; he was unable to keep control over the generals or to establish that military co-operation so essential to success. Arthur Görgey in particular, whose great abilities Kossuth was the first to recognize, refused obedience; the two men were very different personalities. Twice Kossuth deposed him from the command; twice he had to restore him. It would have been well if Kossuth had had something more of Görgey's calculated ruthlessness, for, as has been truly said, the revolutionary power he had seized could only be held by revolutionary means; but he was by nature soft-hearted and always merciful; though often audacious, he lacked decision in dealing with men. During all the terrible winter that followed, Kossuth overcame the reluctance of the army to march to the relief of Vienna; after the defeat at the Battle of Schwechat, at which he was present, he sent Józef Bem to carry on the war in Transylvania. At the end of the year, when the Austrians were approaching Pest, he asked for the mediation of Mr Stiles, the American envoy. Alfred I, Prince of Windisch-Grätz, however, refused all terms, and the Diet and government fled to Debrecen, Kossuth taking with him the Crown of St Stephen, the sacred emblem of the Hungarian nation. In November 1848, Emperor Ferdinand abdicated in favour of Franz Joseph. The new Emperor revoked all the concessions granted in March and outlawed Kossuth and the Hungarian government, set up lawfully on the basis of the April laws. In April 1849, when the Hungarians had won many successes, after sounding the army, he issued the celebrated Hungarian Declaration of Independence, in which he declared that "the house of Habsburg-Lorraine, perjured in the sight of God and man, had forfeited the Hungarian throne." It was a step characteristic of his love for extreme and dramatic action, but it added to the dissensions between him and those who wished only for autonomy under the old dynasty, and his enemies did not scruple to accuse him of aiming for Kingship. The dethronement also made any compromise with the Habsburgs practically impossible. For the time the future form of government was left undecided, and Kossuth was appointed regent-president (to satisfy both royalists and republicans). Kossuth played a key role in tying down the Hungarian army for weeks for the siege and recapture of Buda castle, finally successful on 4 May 1849. The hopes of ultimate success were, however, frustrated by the intervention of Russia; all appeals to the western powers were vain, and on 11 August Kossuth abdicated in favor of Görgey, on the ground that in the last extremity, the general alone could save the nation. Görgey capitulated at Világos (now Şiria, Romania) to the Russians, who handed over the army to the Austrians. Görgey was spared, at the insistence of the Russians. Reprisals were taken on the rest of the Hungarian army, including the execution of the 13 Martyrs of Arad. Kossuth steadfastly maintained until his death that Görgey alone was responsible for the humiliation. Despite appealing exclusively to Hungarian nobility in his speeches, Kossuth played an important part in the shaping of the law of minority rights in 1849. It was the first law which recognized minority rights in Europe. It gave minorities the freedom to use their mothertongue at local administration, at tribunals, in schools, in community life and even within the national guard of non-Magyar councils. However he did not support any kind of regional administration within Hungary based on the nationality principle. Kossuth accepted some national demands of the Romanians and the Croats, but he showed no understanding for the requests of the Slovaks. He even rejected the notion of a Slovak nation in the Kingdom of Hungary., despite his uncle György Kossuth supported the Slovak national movement. Lithograph of Kossuth in 1853. Kossuth's time in power was at an end. A solitary fugitive, he crossed the Ottoman frontier. He was hospitably received by the Ottoman authorities, who, supported by the British, refused, notwithstanding the threats of the allied emperors, to surrender him and other fugitives to Austria. In January 1850, he was removed from Vidin, where he had been kept under house arrest, to Shumen, and thence to Kütahya in Asia Minor. There, he was joined by his children, who had been confined at Pressburg (present day Bratislava); his wife (a price had been set on her head) had joined him earlier, having escaped in disguise. The US Congress approved having Kossuth come there, and on September 1, 1851, he boarded the ship USS Mississippi at Smyrna (Izmir), Turkey with his family and fifty exiled followers. At Marseille, Kossuth sought permission to travel through France to England, but Prince-President Louis Napoleon denied the request. Kossuth protested publicly, and officials saw that as a blatant disregard for the neutral position of the United States. The Magyar asked to leave the Mississippi at Gibraltar. On 23 October, Kossuth landed at Southampton and spent three weeks in England, where he was generally feted. After his arrival, the press characterized the atmosphere of the streets of London as this: "It had seemed like a coronation day of Kings". Contemporary reports noticed: "Trafalgar Square was "black with people" and Nelson's Monument peopled "up to the fluted shaft." Addresses were presented to him at Southampton, Birmingham and other towns; he was officially entertained by the Lord Mayor of the City of London; at each place, he spoke eloquently in English for the Hungarian cause; and he indirectly caused Queen Victoria to stretch the limits of her constitutional power over her Ministers to avoid embarrassment and eventually helped cause the fall of the government in power. Having learned English during an earlier political imprisonment with the aid of a volume of Shakespeare, his spoken English was "wonderfully archaic" and theatrical. The Times, generally cool towards the revolutionaries of 1848 in general and Kossuth in particular, nevertheless reported that his speeches were "clear" and that a three-hour talk was not unusual for him; and also, that if he was occasionally overcome by emotion when describing the defeat of Hungarian aspirations, "it did not at all reduce his effectiveness." At Southampton, he was greeted by a crowd of thousands outside the Lord Mayor's balcony, who presented him with a flag of the Hungarian Republic. The City of London Corporation accompanied him in procession through the City, and the way to the Guildhall was lined by thousands of cheering people. He went thereafter to Winchester, Liverpool, Manchester and Birmingham; at Birmingham the crowd that gathered to see him ride under the triumphal arches erected for his visit was described, even by his severest critics, as 75,000 individuals. Many leading British politicians tried to suppress the so-called "Kossuth mania" in Britain without any success, the Kossuth mania proved to be unstoppable. When The Times tried to fiercely attack Kossuth, the copies of the newspaper were publicly burnt in public houses, coffee houses, and in other public spaces throughout the country. Back in London, he addressed the Trades Unions at Copenhagen Fields in Islington. Some twelve thousand "respectable artisans" formed a parade at Russell Square and marched out to meet him. [this quote needs a citation] At the Fields themselves, the crowd was enormous; but the hostile newspaper The Times estimated it conservatively at 25,000,[full citation needed] while the Morning Chronicle described it as 50,000,[full citation needed] and the demonstrators themselves 100,000. The Foreign Secretary, Lord Palmerston, who had already proved himself a friend of the losing sides in several of the failed revolutions of 1848, was determined to receive him at his country house, Broadlands. The Cabinet had to vote to prevent it; Victoria reputedly was so incensed by the possibility of her Foreign Secretary supporting an outspoken republican that she asked the Prime Minister, Lord John Russell for Palmerston's resignation, but Russell claimed that such a dismissal would be drastically unpopular at that time and over that issue. When Palmerston upped the ante by receiving at his house, instead of Kossuth, a delegation of Trade Unionists from Islington and Finsbury and listened sympathetically as they read an address that praised Kossuth and declared the Emperors of Austria and Russia "despots, tyrants and odious assassins", it was noted as a mark of indifference to royal displeasure. That, together with Palmerston's support of Louis Napoleon, caused the Russell government to fall. Austrian general Julius Jacob von Haynau was attacked by British draymen on his journey in England. In addition, the indignation that he aroused against Russian policy had much to do with the strong anti-Russian feeling, which made the Crimean War possible. In 1856, Kossuth toured Scotland extensively, giving lectures in major cities and small towns alike. "When Kossuth Rode up Broadway"
From Britain Kossuth went to the United States of America. In early 1852, Kossuth, accompanied by his wife, Ferenc and Theresa Pulszky, toured the American Midwest, South, and New England. Kossuth was the second foreigner after the Marquis de Lafayette to address the Joint Meeting of the United States Congress. On December 6, 1851, this revolutionary hero arrived in New York to a reception that only Washington and Lafayette had received before. President Millard Fillmore entertained Kossuth at the White House on December 5 and January 7, 1852. The US Congress organized a banquet for Kossuth, which was supported by all political parties. Queen Victoria had a negative remark about the American version of Kossuth fever too: "...the popular Kossuth fever of the time to ignorance of he man in whom they [the Americans] see a second Washington, when the fact is that he is an ambitious and rapacious humbug." Abraham Lincoln met with Kossuth in Springfield, in a celebration which he organized for the honor of Kossuth, where Lincoln lionized Kossuth. Lincoln called him "most worthy and distinguished representative of the cause of civil and religious liberty on the continent of Europe". Kossuth believed that by appealing directly to European immigrants in the American heartland that he could rally them behind the cause of a free and democratic Hungary. United States officials feared that Kossuth's efforts to elicit support for a failed revolution were fraught with mischief. He would not denounce slavery or stand up for the Catholic Church, and when Kossuth declared George Washington had never intended for the policy of noninterference to serve as constitutional dogma, he caused further defection. Luckily for him, it was unknown then that he entertained a proposal to raise 1,500 mercenaries, who would overthrow Haiti with officers from the US Army and Navy. Kossuth ruined all chances for backing when he openly recommended to German Americans they should chose Franklin Pierce for President.The gaffe brought him back to London in July 1852. Early the next year, he sent Ferenc Pulszky to meet with Pierce to obtain support for intervention in Europe. Pulszky was to also meet in secret with Lt. William Nelson USN and make plans for an expedition against Haiti and Santo Domingo. The plot ended with the failure of Milanese revolution, and Kossuth made no further efforts to win backing from the United States. Gradually, his autocratic style and uncompromising outlook destroyed any real influence among the expatriate community. Other Hungarian exiles protested against his appearing to claim to be the only national hero of the revolution. Count Kázmér Batthyány attacked him in The Times, and Bertalan Szemere, who had been prime minister under him, published a bitter criticism of his acts and character, accusing him of arrogance, cowardice and duplicity. He soon returned to England, where he lived for eight years in close connection with Giuseppe Mazzini, by whom, with some misgiving, he was persuaded to join the Revolutionary Committee. Quarrels of a kind only too common among exiles followed. Hungarians were especially offended by his continuing use of the title of Regent. He watched with anxiety every opportunity of once more freeing his country from Austria. An attempt to organize a Hungarian legion during the Crimean War was stopped; but in 1859, he entered into negotiations with Napoleon III, left England for Italy and began the organization of a Hungarian legion, which was to make a descent on the coast of Dalmatia. The Peace of Villafranca made that impossible. The promise of the international conference never took root, and in the following years, Kossuth, living abroad in Turin, Italy, had to watch Ferenc Deák guide Hungary toward reconciliation with the Austrian monarchy. He did so with a bitter heart, and on the day before the Austro-Hungarian Compromise of 1867 (German: Ausgleich), he published an open letter condemning it and Deák. This so-called "Cassandra letter" rallied the opponents of the Compromise, but they could not prevent its adoption and subsequent continuation. Kossuth blamed Deák for giving up the nation's right of true independence and asserted that the conditions he had accepted went against the interests of the state's very existence. In the letter, his vision predicted that Hungary, having bound its fate to that of the Austrian German nation and the Habsburgs, would go down with them. He adumbrated a subsequent devastating European-scale war on the Continent, which would be fueled and induced by extremist nationalism, with Hungary on the side of a "dying empire". "I see in the Compromise the death of our nation," he wrote. From then on, Kossuth remained in Italy. He refused to follow the other Hungarian patriots, who, under the lead of Deák, negotiated the Austro-Hungarian Compromise of 1867 and the ensuing amnesty. It is doubted whether Emperor Franz Joseph would have allowed the amnesty to extend to Kossuth. Louis Kossuth and his sons. Lajos Tódor Károly is on the left, Ferenc on the right. Kossuth's funeral procession in Budapest in 1894. In 1890, a delegation of Hungarian pilgrims in Turin recorded a short patriotic speech delivered by the elderly Lajos Kossuth. The original recording on two wax cylinders for the Edison phonograph survives to this day, barely audible because of excess playback and unsuccessful early restoration attempts. 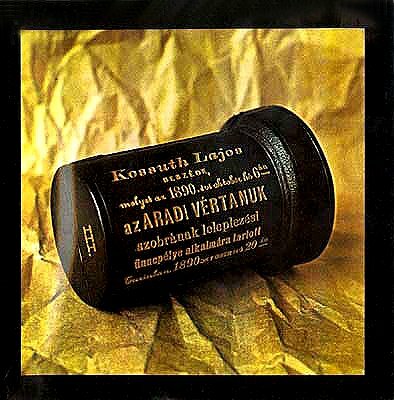 Recording Kossuth's voice was one of the earliest applications of phonograph, and his few sentences are the earliest known recorded Hungarian speech. As Headlam noted, Kossuth died in Turin, after which "his body was taken to Pesth [Budapest], where he was buried amid the mourning of the whole nation, Maurus Jokai [Mór Jókai] delivering the funeral oration"; furthermore, a "bronze statue [was] erected by public subscription, in the Kerepes [Kerepesi] cemetery…" which commemorates Kossuth as "Hungary’s purest patriot and greatest orator." Others[who?] are said to see him as the unwitting author of Hungary's subjugation, rather than its independence. Kossuth Museum in Kütahya, Turkey. Kossuth Memorial originally in Budapest, moved to Esztergom in 2014. Kossuth statue in 113th Street and Riverside Drive, New York City, USA. The main square of Budapest with the Hungarian Parliament Building is named after Kossuth, and the Kossuth Memorial is an important scene of national ceremonies. Most cities in Hungary have streets named after Kossuth, see: Public place names of Budapest. The first public statue commemorating Kossuth was erected in Miskolc in 1898. Kossuth Rádió, the main radio station of Hungary, is named after Lajos Kossuth. Béla Bartók also wrote a symphonic poem named Kossuth, the funeral march which was transcribed for piano and published in Bartók's lifetime. The statue of Kossuth on the Hősök tere (Heroes' Square), Budapest. The most important memorial outside the present-day borders of Hungary is a statue in Rožňava, that was knocked down two times but restored after much controversy in 2004. The only Kossuth statue that remained on its place after 1920 in Romania stands in Salonta. The demolished Kossuth Memorial of Târgu-Mureş was re-erected in 2001 in the little Székely village of Ciumani. The Kossuth Memorial in Arad, the work of Ede Margó from 1909, was removed by the order of the Brătianu government in 1925. Kossuth blue plaque in London, UK. There is a blue plaque on No. 99 Chepstow Villas, the house in Notting Hill in London, the capital, where Kossuth lived from 1850-1859. A street in Greenwich, also in London, is named Kossuth Street after him. There is a letter of support from Kossuth on display at the Wallace Monument, near Stirling. The building of the monument, dedicated to Scottish patriot William Wallace coincided with Kossuth's visit to Scotland. In Serbia there are two statues of Kossuth in Stara Moravica and Novi Itebej. Memorials in Ukraine are situated in Berehove and Tiachiv. The house where Kossuth lived in exile in Shumen, Bulgaria, has been turned into the Lajos Kossuth Memorial House, exhibiting documents and items related to Kossuth's work and the Hungarian Revolution. A street in the centre of the Bulgarian capital Sofia also bears his name. The house where Kossuth lived when in exile, on Macar Street in Kütahya, Turkey, is now a museum. The house is on a hill, with two stories in the back and one facing Macar Street. The walled back yard has a life size statue of Kossuth. The interior is furnished with period pieces, and houses a portrait of Kossuth and a map of his travels. Kossuth County, Iowa, is named in Kossuth's honor. A statue of the freedom fighter stands in front of the county Court House in Algona, Iowa, the county seat. The small US towns of Kossuth, Ohio, and Kossuth, Mississippi, are named in honor of Kossuth. A bust of Kossuth sits in the United States Capitol in Washington, D.C., which also boasts a Hungarian-American cultural center called Kossuth House (owned and operated by the Hungarian Reformed Federation of America). A statue of Kossuth stands in New York City near the Columbia University campus. Other statues of Kossuth are sprinkled throughout the US, including in University Circle in Cleveland, Ohio. There is a Kossuth Park at the intersection of East 121st Street and East Shaker Boulevard, just west of Shaker Square, in Cleveland. In the Bronx, New York, Brooklyn, New York, Utica, New York, Ronkonkoma, New York, Bohemia, New York, Newark, New Jersey, Bridgeport, Connecticut, Haledon, New Jersey, Lafayette, Indiana, and Columbus, Ohio there are streets named in honor of Lajos Kossuth. There is also a neighborhood in Dayton, Ohio known as the Kossuth Colony. Kossuth Road in Cambridge, Canada. During an impassioned eulogy of Kossuth in New York, Alexander Kohut, a distinguished rabbinic scholar, took ill, and died several weeks later. The bust of Kossuth that was added to the United States Capitol in 1990 is presently displayed in that building's "Freedom Foyer" alongside busts of Vaclev Havel and Winston Churchill. Kossuth Road in Cambridge, Ontario Canada was named in Kossuth's honor. ↑ "Wherever we look in Hungary, there is no entity that would constitute a Slovak nationality/nation." ("Bármerre tekintünk is Magyarországon, sehol sem látunk anyagot ily tót nemzetiségre. "); A. B. [Lajos Kossuth], "Visszapillantás a szláv mozgalmakra." Pesti Hírlap, 26 June 1842. ↑ "Kossuth rejected the very idea of a Slovak nation [...]. "; Piotr Stefan Wandycz, The Price of Freedom: A History of East Central Europe from the Middle Ages to the Present. 2001. ↑ "Though partly Slovak by birth, he [Lajos Kossuth] denied the existence of a Slovak nation [...]. "; A[lan] J[ohn] P[ercivale] Taylor, From Napoleon to Lenin: Historical Essays. 1966. ↑ Donald A. Clark, The Notorious "Bull" Nelson: Murdered Civil War General (Carbondale: Southern Illinois University Press, 2011),23–30. Lada, Zsuzsanna. "The Invention of a Hero: Lajos Kossuth in England (1851)." European History Quarterly 43.1 (2013): 5-26. Wikimedia Commons has media related to Lajos Kossuth. Wikisource has the text of the 1911 Encyclopædia Britannica article Kossuth, Lajos. Kossuth at the Capital, NY Times article, Dec. 30, 1851. This page was last modified on 15 May 2016, at 17:13.